H&H welcome Pigs x7 with support from Cattle on March 29th 2019! 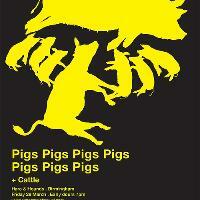 We're dead chuffed to bring the Pigs back to Brum for another night of fun. Joining them, Supersonic 2018 highlight - Cattle - bringing their own strand of raucousness (plus, we couldn't resist a good animal theme). Strap in for a night of double drumming, heavy riffs, sweaty Pigs and thundering hooves? !